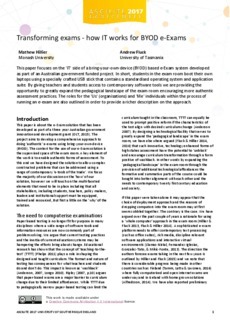 This paper focuses on the 'IT' side of a bring-your-own-device (BYOD) based e-Exam system developed as part of an Australian government funded project. In short, students in the exam room boot their own laptops using a specially crafted USB stick that contains a standardised operating system and application suite. By giving teachers and students access to contemporary software tools we are providing the opportunity to greatly expand the pedagogical landscape of the exam room encouraging more authentic assessment practices. The roles for the 'Us' (organisations) and 'Me' individuals within the process of running an e-exam are also outlined in order to provide a richer description on the approach.